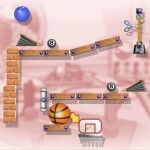 Crazy Machines by dtp Entertainment AG is a wonderfully creative problem solving game. The professor presents you with experiments that are not quite complete. He tells you the goal of the experiment and the tools that you need to make it reach its goal. You must figure out how to use the tools at your disposal to make things work the way they should. This app has a similar premise to that of Fantastic Contraption. I found this app to be much easier to play and therefore much less frustrating. It was, however, still challenging enough to make solving the puzzles rewarding. Crazy Machines also makes use of many more tools to accomplish the goals of the experiments, which I thought gave the game much more variety and interest. While the game is easier to approach than other games like it, I would still highly recommend beginning with the tutorial. It only takes a few minutes and will walk you through all of the basics of the game. After you complete the tutorial, you can easily move on to the first experiment. At the beginning of each experiment, the professor will explain the goal of the experiment and may even give you some hints about how the tools should or can be used. You can see these instructions again if you need to at any time by tapping on the blue button with the exclamation point on it. To run the experiment, tap the green play button. Sometimes when I didn’t know what to do, I found that the best way to start was to run the experiment and see where it went wrong. Each time you run the experiment, you must press the red stop button to stop the experiment. Only after the experiment has been stopped can you work on it and make changes to the components. The components that are on the screen when you start the level are not adjustable. For the most part, the only components that you can make changes to are the ones that you add to the experiment. These adjustable pieces blink on the screen to indicate that they are adjustable. When you tap on a component in the experiment it brings up a circular menu that gives you many tools including ones that move, turn, delete, activate, and provide more information about the component. One thing that took some getting used for me was that you cannot move the components by dragging them around. You have to touch on the the tool that moves the component and drag the component by dragging the tool button. In the end, this method is easier because you can see the placement of the component better when you finger in not right on top of it. For each experiment, you have a limited number of components that you can use. These components can be found in your component inventory, which is accessed by tapping the yellow gear button. Sometimes you may not recognize a component or know what it can do. You can easily find out by placing the component on the screen and then tapping on it and tapping again on the question mark button. This button will bring up a brief description of the item and it’s properties. There seems to be an endless list of objects and tools that are used in Crazy Machines. Everything from ropes to ping pong balls and motors with drive belts that need power supplies. The variety of the materials and the challenge of the puzzles will keep you interested and coming back time and time again. The app stores up to three profiles, allowing you to save multiple games concurrently. I highly recommend Crazy Machines to anyone who likes solving puzzles. Crazy Machines is $2.99 in the iTunes App Store.